Books were only the beginning, next came newspapers. But by this time the authorities, at least in Britain, had a response ready. All newspaper sales carried a tax called stamp duty. This limited publications of the more marginal radical press. And, by the early 20th century, when radio was introduced, the British government immediately nationalised it and set in place measures to control the newly established BBC. In the 1960s when pirate radio came about the UK government took firm steps to suppress even though there was no political content. When the internet came along in the mid 1990s it became apparent that the end of the line had been reached with government influence over control of content. While governments would dearly love to restrict access only to 'approved' internet sites the sheer volume of content mitigates against this. So has technology finally, completely democratised information? Maybe, the jury is still out on this one. The volume of internet sources means that most people still turn to the familiar news sources, the BBC and the online newspapers with familiar names. And it's not just hard political news that the censors want to control. Market economics dominate manufacturing. Manufacturing jobs gravitate to the east and products in the shops are largely big name brand name products. And the big names manufacturers want to keep selling new products they certainly don't want to encourage a culture where people start repairing things! The people behind this site, IFIXIT would like to change a few things. This is a free website where an online community is gathering repair information for all manner of tech. items. But not everyone thinks it's a good thing. It's not so good if you are Apple or the Ford Motor Company wanting to sell new stuff. As Kylie Wiens of IFIXIT explains, the big companies don't like it, "They really want us to put down our screwdrivers and get back in line at the appliance store." As a result the website has met opposition with demands and threats that they remove some of the repair information as being proprietary proprietary to the original manufacturer. At one time the notion that an individual couldn't repair his own broken stuff would have been incredible. But such is the power of these multinationals that the can mobilise legal muscle to sustain the throwaway culture. The goal at IFIXIT is to show people repair technology and keep it going as long as possible, the alternative IS the landfill. Maybe the new products of the future will be machines with a generic (possibly recycled) processor for a heart, a body printed on a locally located 3D printer and an open source software soul. 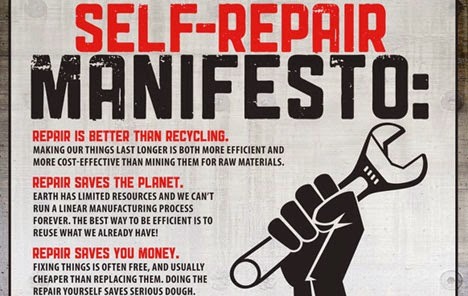 But until that comes along maybe we can reduce the cost to the planet by keeping our stuff going a bit longer through IFIXIT.